I was having a great discussion about paper, printers, sales people and the always changing business environment with my sister over the holidays. 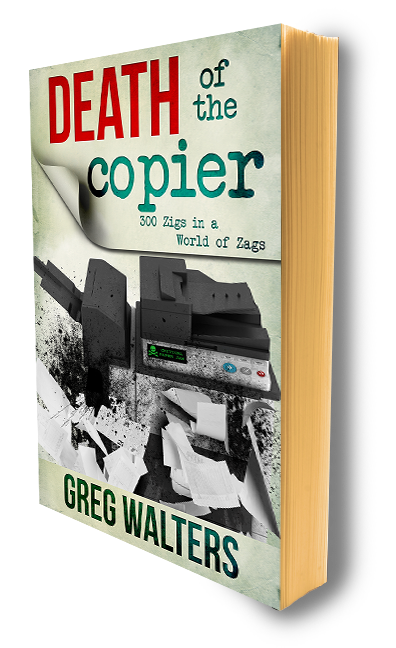 She's always goaded me about "The Death of The Copier" - like most, she believes I hate copiers, printers, and paper. I don't. Of course, she's been with the same paper company for 27 years, as with most conversations along these lines, she defends ink on paper like her lively hood depended on it - I guess, in a way, it does. We talked about how reductions in her industry have led to less people yet more productivity. The parallels between the premium paper and copier industry is logically, familiar. My sister will be fine selling high-end paper to large printers who use billion dollar machines and an Indigo or two. Still, we talked about the decreasing level of value her sales team provides for customers - again, familiar territory. And so it is with our niche - as copiers became a commodity, more advanced talk tracks refrained from mentioning first copy out speeds, scan-once print-many, or manufacturers - ushering in the the death of the copier and the birth of EDM/DOC MAN. Some say managed print services has been commoditized. I disagree. I believe the definition has been dumbed down to the lowest common denominator - toner delivery. It was inevitable. EVERYBODY ELSE SELLS MPS. This is why I say, in 2015, give up selling managed print services. Instead, talk about giving your client more hours by squeezing the amount of paper in your their workflow. Incorporate paper flow into your basic assessments its simple, just ask. "At ABC Company, I helped them find a better way to process payables..."
"At XYZ Company, we helped IT complete two initiatives..."
"I've helped my customers see more of their children's soccer matches..."
You can still make quota and move away from being thought of as pushing commodities. When you start feeling the pressure of commoditization, think how difficult it would be to get up each morning and sell paper. If what I'm saying makes a bit of sense, but you're not quite sure how to execute in the trenches, reach out to me and let's see get some business going.